The season of Lent, beginning with Ash Wednesday and ending with the celebration of Easter, brings with it new opportunities for contemplation, reflection, worship and celebration. At The Briarcliff Congregational Church, our Lenten events include worship for Ash Wednesday, a Lenten Bible Study, Maundy Thursday, and Easter (of, course!). Don’t miss our annual family-friendly Easter Egg Hunt. On Ash Wednesday we will gather to begin the journey of reflection, repentance, and renewal with a service of ashes. You will be invited to come forward during the service and receive ashes as a mark of your participation in the journey, as a mark of your willingness to change in ways that may be out of your control or desire, as a mark of our being fellow sojourners on this mysterious trek through a wilderness of time. After confessing our shortcomings we will receive Communion. As always, everyone is invited to partake in that awesome assurance of forgiveness. Beginning on March 18 you are invited to participate in a study of the trial of the century. Make that the First Century! Together we will explore The State vs. The King of The Jews, a play by Curt M. Joseph. Each week you will play a part in the story. Sometimes you’ll be the judge, sometimes the jury, sometimes the lawyers or witnesses. Every time will include a brief debriefing of the material as we learn about the people who were present at the time of Jesus’ arrest, trial, and crucifixion. We will hold court each week in the Eastman Room. Refreshments (and perhaps justice) will be served. Come experience the Stations of the Cross from two local artists. Dave Morrison will be sharing new pieces of fused glass and Rev. Farnsworth will be sharing photographs from our parks. A family friendly event open to the greater Briarcliff-Ossining community! Join us for our annual Easter Egg Hunt complete with a visit from the Easter Bunny. Appropriate for all ages. Please stop by, bring your neighbors and friends, and join in the fun! Please arrive a few minutes early and bring a basket to collect the eggs in. Rain or shine. 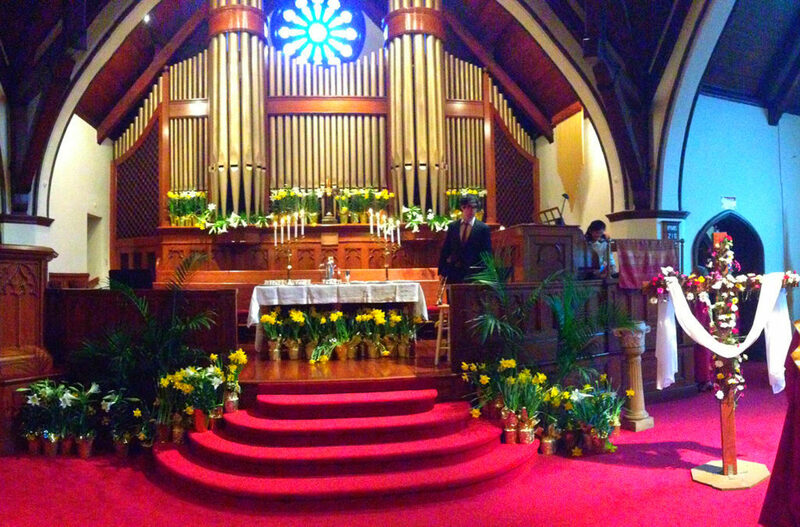 Please note: there is no church school on Easter Sunday but the nursery, located in the Sanctuary building, is open during the 9:30 service.